Volkswagen says its new electric vehicle range marks a transition as significant as the shift from the Beetle to the Golf over 40 years ago. Alex Grant finds out what it means for the group. Volkswagen’s I.D. electric vehicle range will include four models by 2022. Volkswagen is on the cusp of a new era. 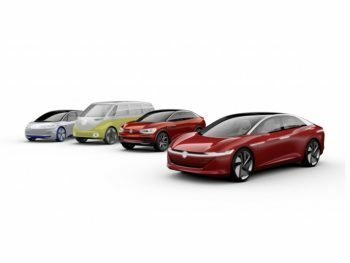 At the end of 2019, it will begin series production of a Golf-sized electric hatchback called the I.D., debuting a modular platform and electrical architecture that’s entirely separate to the rest of the range. A move which, it says, is as significant a technological shift for its model range as the launch of the Mk1 Golf in 1974. That’s some claim. The Mk1 Golf – derived from technology Volkswagen had acquired when it bought out German carmaker NSU – enabled the company to replace its air-cooled, rear-engined best-seller with a car more in line with the water-cooled, front-engined segment norms. It wasn’t the first to move over to the new layout, but it was the first to take it into the mainstream. As a sign of its legacy, most of the Volkswagen range still uses a similar layout today. The Volkswagen Group already has plug-in hybrid and battery-electric vehicles, but the I.D. is as technologically different to today’s Golf as the Mk1 Golf was to the Beetle. Instead of starting with a petrol or diesel car and converting it to electric power, it uses a bespoke new platform called the modular electric drive matrix (MEB), designed only for electric power. This isn’t a side project. By 2022, the four group brands will have 27 different MEB-derived models worldwide, and the aim is to offer electric vehicles with comparable range and pricing to a petrol or diesel model. So far, Volkswagen has given the clearest picture of how that will shape up; I.D. will be a separate range to its familiar nameplates – similar to BMW’s i range – and comprise four models by 2022. Expect the Golf-sized hatchback in 2020, followed by a compact SUV, an MPV homage to the classic Microbus, and a saloon car. By 2020, the brandis aiming to sell 150,000 plug-ins per year globally, with two thirds of those set to be based on the MEB platform. The aim is to reach one million plug-in sales per year by 2025. With no need to accommodate a combustion engine and its ancillaries, the MEB offers much more flexibility in terms of layout than a traditional platform. 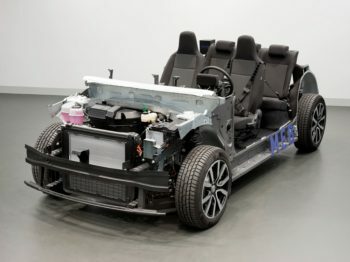 It’s a similar skateboard-like layout to the foundations of the Tesla Model S and Model X – a battery under the floor to maximise cabin space, powering a motor either at the rear or at both axles. Power electronics are packaged into the front end. Just as the Golf’s MQB platform is shared across the product range, from the Polo hatchback to the Atlas/Terramont large SUVs sold in global markets, the MEB is scalable to suit multiple bodystyles and the different end-user requirements they have. Power outputs can be varied, and so can the battery capacity, offering a (WLTP-derived) range of between 205 and 310 miles, based on the car’s cost and application. What’s also new is the electrical architecture. The MEB platform consolidates the functions of up to 70 individual control units for on-board systems into a handful, and introduces a new operating system which can be updated over the air. In turn, it means the vehicles it underpins can tap into a multitude of connected services, including telematics, fleet management and car sharing, and potentially avoid trips to the workshop for in-life updates. Volkswagen says most charging will take place either at home or work, so it’s offering solutions for both. The ‘Volks-Wallbox’ will offer AC charging at up to 11kW, restoring all of the range overnight, and prices will start from €300 (£266) excluding installation. Later versions will support DC charging at 22kW, and the ability to feed energy back into the grid – balancing the load, and providing backup power for homes and offices. For longer journeys, the platform is designed to take a 125kW charge (more than twice the speed offered by today’s 50kW rapid chargers), which can replenish 80% of the range in around half a hour. Volkswagen is a stakeholder in the pan-European Ionity network, which has already started installing 400 fast charging points across the region, and has outlined plans for membership-free access to public infrastructure via its connected services. Pre-series production is already under way in Wolfsburg, ahead of the first UK cars arriving in 2020.